I have a few minutes to write as I sit on my porch, under the icicle Christmas lights I rebelliously refuse to take down, contemplating what else to do with all the cherries I swiped today from an ancient tree in someone’s front lawn. But I’m getting ahead of myself here. 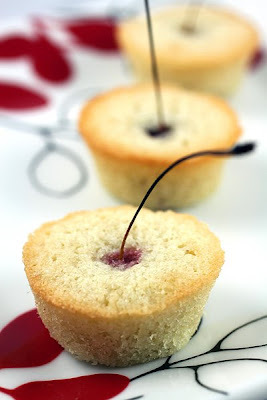 On a food blog site yesterday I spotted some adorable little financiers. I wanted to reach in and pull them out of my screen by their little stems. They were so cute in fact; I just had to make them! Unfortunately, little sour cherries aren’t sold around here. You have to have a tree, or find some growing on a tree. I don’t exactly know anyone with a sour cherry tree, but I knew where there was one. A very old large one left over from what was once an orchard. I grabbed a sack, my small daughter, the newly sheared overexcited Miniature Australian Shepherd, and ran out to see about collecting a “few”. We arrive and knock on the door. No one is home, just great. So, what to do? What would you do? Um well, the cherries were perfect, better than perfect and wouldn’t last but a couple more days on that tree. So, I started to pick everything I could reach, which wasn’t a lot as I’m a shorty, and that old tree is the cherry equivalent of a great oak. Now the key to stealing cherries is to look like you know what the hell you’re doing. Look like you are supposed to be there, as everyone across the street in the public park is eyeballing you like the crazy thief you are. Ok I am kind of an intruder and likely crazy, but those beautiful cherries would go to waste without me. Maybe, just maybe, these adorable treats taste even better because of the forbidden fruit! 2. Spread the almond meal in a single layer on a baking sheet and toast in the oven until slightly golden. Let cool. 3. Melt the butter in a small saucepan on medium-low heat, stirring occasionally until the solids separate and turn lightly toasted. The butter will take on a fragrant, nutty aroma, and a golden, honey color. 4. Use a fine strainer lined with cheesecloth or (in a pinch) paper towel, to strain out the solids. Reserve the clear golden butter, and let cool to room temperature. 6. Use a tablespoon to measure out a tablespoon of batter per muffin tin. (I used a size 60 mini cookie scoop) Gently place one pitted cherry in the center with the stem poking straight up. 7. Bake at 375ºF for 12-15 minutes each, or until slightly crisp and golden brown on the edges. Cool in the pan for ten minutes before gently pulling them out (don't hold them by the stems while they're still hot) and letting them cool on a wire rack. Notes: The financiers are even better the next day. They're softer and the flavors mingle together in a sort of cherry almond heaven. The photo makes me want to eat them right now. I think these were worth the thievery! Sometimes there are things that are just meant to be stolen. Fabulous! *Thank you for your response back at my place. I really do appreciate your willingness to help. LMAO!! 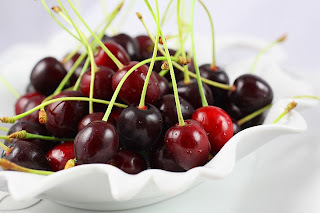 I adore sour cherries and fortunately we can get them at the Farmer's Market here...so I don't have to get them on the sly...ha ha ha ha. These are adorable...yummy! Oh worth the thieving for sure. Looks so fabulous! Anything forbidden is always better in my book! So, not but 2 minutes ago, I was leaving a consoling message on lovella-at-home.blogspot.com re: thievery. While I don't condone the pilfering, oh,,, I might have done the same thing,,,, what am I saying? I HAVE DONE THE SAME THING, I must confess.... apples, last year, no one home and I needed apples, THOSE APPLES (none other would do!) Okay, so now I feel better with confession off my shoulders. None the less, those are just cute little gems!!! I love them! They came out fantastic. So happy you like the recipe. And I'm sure they taste even better with the stolen cherries! You cherry thief you... ;). Adorable financiers though! Why is it you never see sour cherries for sale? Wonder what the home owner would do if he/she read your blog? Yikes :). Better make a batch and deliver them! What fanciful little treats. They look wonderful, Laura. I love the recipe. Hello Laura, for years I have not seen sour cherries in Ca. and I love the taste better than sweet cherries. I thought that maybe I couldn't get sour cherries because I live in a small down in a rural state. Now I wonder if it's just another fruit variety that is being weeded out? So cute and I love you made them with "forbidden" fruit! Yeah I should make some for the homeowners lol. Although I don't think they live there and are renting out the house. The fruit seems to go to waste every year. Sad huh? Having been on the other side of fruit pilfering more than once I can only say, bake a second batch and take them to the tree owner as a thank you. Own up and share the bounty. Knock, drop, and run if you're embarrassed. Lol Lori! I guess it's in our female genetic code. Wow, 20 gallons of wild grapes. I can't even imagine! I would have been ecstatic! These look great. I have some fresh cherries and wonder if I could use them instead? Hi Laura, I'm back! Great to stop in for a visit! And this post had me laughing out loud right down to the stolen cherries finding their way onto the mayor's plate! I love cherries and I think these financiers must've been so delicious. And they are too adorable! Welcome back Jamie! I hope the move went well! Hi Jo, as long as they are small and fit in a mini muffin tin they should work. Totally worth it. These are so lovely ~ esp. w/ the stem peeping out. Very nice! Laura - Thanks for the flicker invite. I went to it and drooled! OMGoodness,,, that looks amazing. I will be stopping by the store and picking up a few things to put along with the zucchini pizza! YUMMMMMM.... I will let you know how it turns out!!! I hope it turns out well Lori. We loved it here! Thanks for the zucchini challenge. I have another one I want to do next week. Hahaha you walk the line! Feeding law-makers and law-inforcers your law-breaking treats! A sneaky rebel indeed! I hope this isn't a stupid question, but can I substitute the sour cherries with bing cherries? That's not a stupid question! You can, but they need to be small enough to fit in a mini muffin tin with batter around it. I had to laugh at your post! I have a neighbor with a sour cherry tree. Luckily he said I can pick all I want :) I need to get back over there and get some more before they begin to fall. Also, I made these same lovely little Financiers yesterday and they were divine! Only I had already removed the stems (rats). They were very yummy though! omg how cute are these? Would love to pop a few in my mouth right now. from one laura to anouther. we have just found what w think is a sour cherry tree in our garden! we have lived here for two years and did not know it was there.it did not fruit last year! not knowing what to do with so many i googled and found you! I am so glad you found me Laura! I hope you enjoy these, and your newfound sour cherry tree. just came across your blog and found we have lots of things in common: food, writing, photography and motherhood! Thanks for visiting me! I went and looked through your lovely blog. Your work is beautiful. We do have much in common! When I lived in Los Angeles, I would often pilfer fruits and such from the neighboring area. I mean, it would just rot on the tree! Grapefruits, oranges, limes, lemons, pomegrantes, persimmons and figs. Some chili peppers, too.... I would usually steal by cover of darkness, tho! Delish! I'm glad I'm not the only one! That's awesome.